Owning a 4x4 car can be quite an expensive undertaking. After you have taken into consideration the purchase price, road tax and petrol, you still have to pay for the costly annual car insurance premiums on a 4x4 vehicle. But if you are a 4x4 owner or are eager to get yourself an off-road car, read on to find out more about getting cheaper insurance quotes for it. An off-road or 4x4 car was once upon a time seemingly reserved or exclusive to countryside drivers. Being able to drive your 4x4 across all sorts of terrain was its defining feature, but more often these days, the off-road aspect is becoming a novel one that isn’t as commonly used. In most cities, not just in rural areas, you will find many families being driven in a 4x4, for that school run, the daily commute and regular day-to-day urban living. Many drivers like the safety a 4x4 offers, but also many of the designs on modern 4x4 cars are becoming just as attractive as the more traditional cars on the market. So it is no surprise that 4x4 cars are becoming the norm, whether it is for driving on gravel, grass, snow, sand or plain old tarmac. The type of 4x4 car insurance you get will depend on the make of the vehicle and how you plan to use it. But there is a way to get cheap 4x4 car insurance quotes. Read on to learn more. With the increased popularity of 4x4 cars, more and more car companies are making off-road vehicles to suit a range of driving styles and customer needs. While the classic 4x4 cars still remain iconic, popular options, such as the Jeep, Land Rover and Range Rover, there are several relatively newer off-road cars to give you a wider choice, depending on price range, styling, fuel and many other factors. There are also now more hybrid stylings with SUVs also having 4x4 capability, making these types of car more accessible than ever. They can pretty much drive anywhere (although some vehicles that look like 4x4 cars do not always have the off-road capability, so double check that before buying) and can pull pretty much anything, making them great for big family holidays. However, the major down side with a 4x4 car is the cost that comes with owning one. Despite the increased options, 4x4 vehicles are still some of the most expensive cars on the market. Due to their size and power 4x4 cars are also very expensive to fill up at the petrol station. On top of this, any repairs you have to make could cost you extra, as the parts used in making a 4x4 are often bigger and more powerful than normal car parts. So if you are still thinking about buying a 4x4 car, you will need to consider what you want from it, and will then hopefully help you to determine what type of car insurance you want for it. What type of 4x4 car is best? As mentioned previously, 4x4 cars have increased in popularity, meaning you are just as likely to find them being driven around in cities as you are in the country. So the first thing you need to ask yourself is if you plan to drive this 4x4 off road and get it muddy on a regular basis, or if you are simply going to stick to urban streets. Some 4x4 cars were built to get really dirty, allowing you to clean them on the inside just as easily as outside, so you would obviously not want to be using one of the nice luxury models for regular off-road driving. And on the issue of regular off-road driving — you will need specialist or additional cover for off-road insurance, so be careful when taking your 4x4 out for a spin. If you decide to go off-road and something happens to your 4x4 car, you may not be able to make a claim on your car insurance if it only covers you when driving on regular roads. You will also need to consider a 4x4 car that can really handle off-road driving and decent off-road tyres, so do your research first. If you are planning to keep it on the streets all the time, then you will probably have less of a hard time finding the right 4x4 car insurance for you. You still may want to consider what type of engine you want on your 4x4 car. You can now find 4x4 cars with a petrol, diesel or hybrid engine. So if you want a 4x4 car but are still keen to avoid having a large carbon footprint, you could opt for a hybrid engine, which uses electricity and petrol to power the engine. They can also work out cheaper in the long run in terms of petrol costs. For driving longer distances, gaining more speed and power, petrol and diesel options on a 4x4 car might be better for you. These factors also have an impact on the insurance group your 4x4 car will belong to. 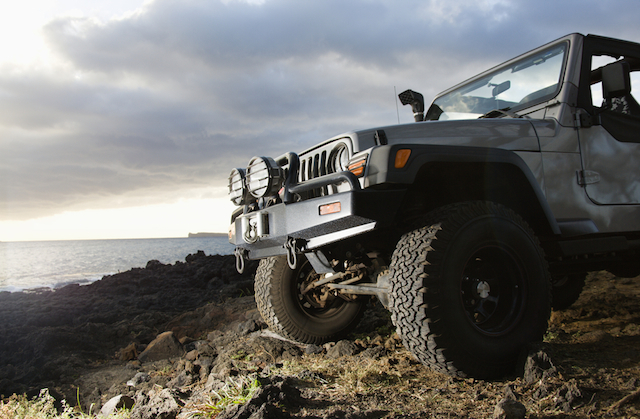 The cost of 4x4 car insurance will depend on the type of 4x4 you own. The more expensive, luxury 4x4 cars will be in the high end of the 4x4 insurance groups, meaning you are likely to have to pay more on your premiums. And vice versa: the lower end 4x4 cars will usually be in the cheaper 4x4 car insurance groups. This is usually because the more expensive the car, the more expensive the parts are to repair. In addition to this, with 4x4 cars, some of the heavier, more powerful cars can also be quite costly to insure for similar reasons — because the parts are more expensive and difficult to replace or repair. Generally, the bigger, the more powerful and heavier the 4x4 car, the more likely that its parts will be expensive to repair, putting it on the higher end of the 4x4 insurance groups. Also, the age of the car can make a big difference to the price and what category of insurance groups it belongs to. A car in the lower end of the insurance groups could be placed higher as it ages, or vice versa. These variables often depend on the make and model of the car, how easy it is to repair, the reliability and availability of replacement parts. But the cost of the 4x4 car insurance will often depend on your reliability and how risky you might be seen to be by the insurance company. One plus point to 4x4 car insurance costs is that if you are on the receiving end of a road collision, you and your car are more likely to come out in decent condition. However, car insurance companies are more likely to approach this from a different angle. For example, if you happen to drive into the back of someone's car, your 4x4 is likely to inflict a lot more damage than it will take. Remember, a 4x4 car is usually much heavier and more powerful than most other cars on the streets, so insurers will be weighing this up when assessing your risk. When comparing 4x4 car insurance, decide if your 4x4 car is right for you and your lifestyle, and check that the policy will cover you for everything you need it for.